Construction of the Athabasca Pipeline, 1998. Source: Oil and Gas Journal, 26 April 1999, p. 61. For the third time in the past month a major pipeline rupture has spilled oil in the province of Alberta. According to the province’s regulator, the Energy Resources Conservation Board, an estimated 1,450 barrels of heavy crude oil (~230 cubic metres) leaked from a pumping stationalong Enbridge’s Athabasca Pipeline, a 541 kilometre pipeline that transports up to 345,000 barrels of oil per day. The pipeline first opened on March 31, 1999 and was said to have a potential capacity to transport up to 570,000 barrels per day, but began at just 100,000 barrels. Enbridge spokesperson, Jim Rennie, told the Edmonton Journal at the time, “We have built for the future.” The Athabasca Pipeline, the largest crude oil pipeline exclusively within the boundaries of Alberta, was a critical piece of infrastructure for the expansion of bitumen mining and tar sands development in the late 1990s, linking the petroleum resources of northern Alberta to Canada’s existing crude oil pipeline network. The completion of this pipeline in 1999, less than a year after the Alberta Energy Utilities Board granted regulatory approval, expanded Enbridge’s network to 11,185 miles of main pipeline, the largest in the world. During the EUB approval process, there were only three intervenors who initially opposed the project, but later rescinded their opposition. EUB noted that “no social, environmental or safety issues were raised by the intervenors.” Enbridge built the pipeline through very difficult terrain in a forested and muskeg environment that was inaccessible through most of the winter. Regulatory limitations were eased by the cooperation of the Department of National Defence, which permitted the company to run the pipeline directly through the Cold Lake Air Weapons Range, a NATO air training facility. Location of 2012 Elk Point heavy crude oil pipeline spill. 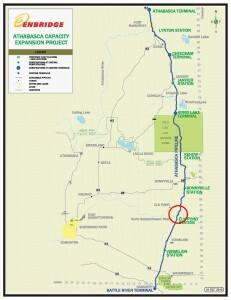 Enbridge now hopes to expand to the full capacity of 570,000 barrels per day on the Athabasca Pipeline. The company plans to achieve this goal through modification of five of its existing pump stations and the construction of four new stations. The ERCB granted regulatory approval for this expansion last year on May 13, 2011 and civil construction at the Elk Point and Vermillion pump stations began in October 2011. Enbridge has invited members of the public to submit any questions or concerns to its toll-free line at 1-888-263-3654 or send an e-mail toathabascaprojects@enbridge.com. While the ERCB and the company reported that the spill has not contaminated any waterways, this particular pipeline does cross two of the province’s largest rivers, the North Saskatchewan River and the Athabasca River. The Athabasca River was one of the first waterways in Alberta to suffer from a major oil pipeline spill from tar sands development. In June 1970, a Great Canadian Oil Sands Ltd. (now Suncor) pipeline ruptured and spilled 1,190 barrels of synthetic crude oil (~189 cubic metres) into the river. The spill flowed into Lake Athabasca where local residents could see the oily sheen on the surface of the lake. This was one of the earliest major oil spills on a pipeline carrying synthetic crude from Fort McMurray to Edmonton. The processing of bitumen into synthetic crude oil was in its infancy then and very few companies had established operations in northern Alberta. Today the tar sands industry has grown substantially with many dozens of multinational corporations operating in Alberta’s northern region. The pipeline network that carries liquid petroleum throughout the province now totals more than 370,000 kilometres. Oil pipeline spills historically have occurred on a regular basis on Alberta’s network. Between 1990 and 2005, there were 4,769 pipeline releases of liquid hydrocarbons on the province’s pipeline system. Between 2006 and 2010, there were 1,647 pipeline failures. In 2010 alone, there were 20 crude oil pipeline failures and 241 multi-phase pipeline failures (carries crude oil and gas). According to the ERCB, these pipeline failures released 3,400 cubic metres of liquid hydrocarbons or roughly 21,000 barrels of oil. If we consider just the crude oil pipeline failures in 2010, there were an average of 1 pipeline failure every 18.25 days. If we include multi-phase pipeline failures, that’s 1 every 1.4 days. The recent spill of crude oil near Elk Point is just one of many in Alberta’s past. A better understanding of the environmental history of oil pipeline spills is necessary in order for Canadians to assess the environmental risks associated with new oil pipeline expansion projects. The map at this URL marks major oil pipeline spills in Alberta between 2006 and 2012. Edmonton Journal, 21 April 1999, E1. Globe and Mail, 21 April 1998, B8; Oil and Gas Journal, 26 Apirl 1999, p. 60.